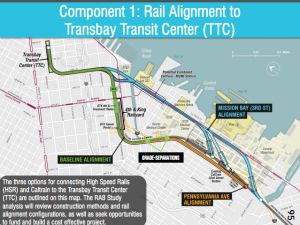 The release of importantÂ information from a study about potential alternative options for the Downtown Extension of the Caltrain tracks to the Transbay terminal has been postponed following Mayor Lee’s death and the transition in San Francisco leadership. Information about estimated cost and time to construct alignment alternatives was proposed to be released by San Francisco planning department staff in the middle of 2017, but that date was delayed, and now Planning isn’t making any predictions about when the information will be available. 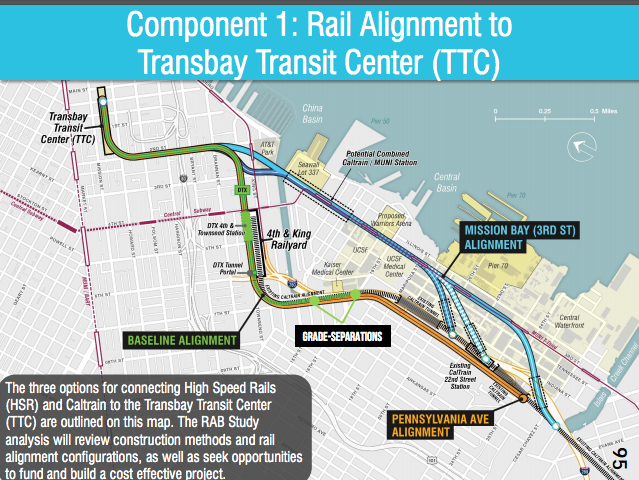 TheÂ options being considered included potentially extending a tunnel down Pennsylvania and avoiding a roadway underpass at 16th and 7th street, and swinging the tracks in a tunnel around Mission Bay. While Planning Director Rahaim asserts city departments are working with interim Mayor Mayor Farrell to continue talks with the set of partners that would need to work together on the project (such as Caltrain, the State of California and the High Speed Rail project, the owner of the railyard land ProLogis/Cattellus, and others), we wonderÂ how much leadership Mayor Farrell will be willing to exert between now and June to build agreement among project partners and to go public with information that – regardless of which alternative looks most attractive – will make somebody mad. For those who haven’t been attentively following San Francisco politics Supervisor Farrell was chosen by the Board of Supervisors to be a “caretaker mayor” until the election in June, with supporters making the argument that it would be better to replace Supervisor London Breed, whoÂ had been serving as acting mayor because her role as President of the Board of Supervisors, and to choose someone who was not running for the Mayoral office in the June election. For more on the San Francisco political drama, see here and here. The study is officially called the “Railyard Alternatives and I-280 Boulevard Feasibility Study” because the set of concepts initially included taking down the stub end of Highway 280, boulevardizing the roadway, and developing land at 4th and King currently used to store trains. The highway teardown idea drew some pointed opposition and was dropped from nearterm consideration. Here is the text of the letter from Planning Director John Rahaim, as sent to the members of the Citizen Working Group. I hope your new year is off to a good start.Â I realize that it has been a great while since we have connected with you, and I wanted to update you on the status of the study. Â Chair Ron Miguel and I have discussed the need to communicate with all of you, and Ron has asked that we send you this memo. As you know, we had hoped to be holding public workshops on the elements of RAB, including the preferred rail alignment into the Salesforce Transit Center, in 2017. Â For a number of reasons, that has been delayed.Â It has been a team effort across the City departments to complete this work. The City is now in the process of sharing, vetting, and fully understanding the benefits and impacts of the analysis with our regional and state agency partners as well as federal agencies. Â We believe it is important to fully vet our analysis with these agencies prior to a public meeting, since these conversations are critical to securing full collaboration with our partners. Â Some of these partner agencies are tasked with providing transportation services or own land and infrastructure that would be affected by changes that may be suggested through the RAB Study.Â Mayor Lee had, before his death, begun many of those needed conversations. With his sudden death, there has been a necessary delay in these talks. We are now moving through this process as quickly, and deliberately, as possible and are working with Mayor Farrell and his staff to re-kindle these talks. Please know that we share your concern for the study and will update you about the study and its schedule as soon as we can. We understand the frustration that many of you have with the delay of publication and distribution and will ask for your patience as we work through these necessary steps in the coming weeks. Thank you all in advance for your continued ideas and support in this process. Â And please do not hesitate to contact me or Susan with your questions and concerns. In the grand scheme of things, do we want to replace the 4th & King and 22nd Street stations that are already on the edge of SF and put them further on the edge of SF? I just don’t see the how that station could capture a greater market share than current situation in both regular and reverse commutes. Not surprised to see this study shelved indefinitely. The only interesting part was the idea of turning 280 into a boulevard which seems unlikely to have enough public support to do any time soon. There already exists a perfectly fine, environmentally cleared design for DTX, all that is missing is the money to build it. Shifting the alignment to 3rd St. would do nothing to help that and would just make the project more expensive and delay it even further. Also, the decision to eliminate the only feasible loop track alignment (Main St.) from consideration because it might not work for HSR (who don’t need it…) was bizarre. A loop track for Caltrain is the best way to increase the capacity of the Transbay Terminal enough in the future so that all HSR and Caltrain trains can stop there. I’m afraid that eliminating this alternative now will allow something to be built at Seawall lot 330 that blocks this option forever. I don’t think it’s necessarily dead, I’m just skeptical that Mark Farrell as interim mayor is going to put in the work to build behind-scenes agreement and take the heat for any outcome that not everyone is going to like. Yup, that’s a big question about the cost-benefit of the Mission Bay alignment. The 22nd street station would likely get more riders if it was rebuilt somewhere near the current location. Any change would require a major reconstruction to be ADA compliant which it isn’t right now with the stairs. Waiting until a new mayor is elected in June is just a blink of an eye on the glacial timescales of this project.